The seven seals of Revelation, come from the Scroll that only one person can open; the Lamb of God who was slain, Jesus Christ. And as the apostle John, saw the Lord open them, he saw the events of each of its seven sections, and recorded what he saw according to the direction of the Lord. 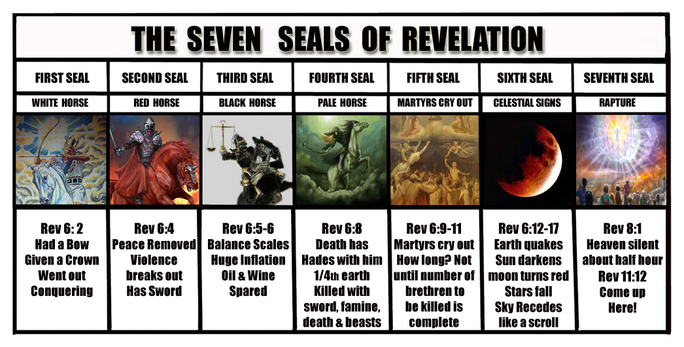 These seven seals lead to and include the rapture, as the 6th and 7th seals are the rapture. Please read the verses and commentary, and see the events leading up to the rapture unfold showing correlation with other sections of Scripture. As the Lord opens the first four, each of the four living creatures, call unto John to “Come and see” as each of the first four Seals revealed are four horses with riders with very distinctive purposes. The 5th seal shows a huge martyrdom situation on earth. And the 6th and 7th, show a facet of the rapture itself. The events of the seven seals, correlate with Matthew 24:1-51, Mark 13:1-37, Luke 17:20-37﻿ and Luke 21:5-36. SEAL #1 / Revelation 6:1-2 "Now I saw when the Lamb opened one of the seals; and I heard one of the four living creatures saying with a voice like thunder, "Come and see." And I looked, and behold, a white horse. He who sat on it had a bow; and a crown was given to him, and he went out conquering and to conquer." The wicked one is "given" a crown and he is riding a white horse, but he is not Christ. He is the "Antichrist," meaning a false-Christ (Matthew 24:4-5) who does not claim that "he is Jesus" but that "Jesus was not the Messiah" because he will come as "the long-awaited Messiah." An imitation Christ - an imitation Messiah. The devil always wanted to be like the Most High God and now he sends his top evil one, to deceive the Jews, the world and if possible to deceive even Christians that do not know their Bible and have a strong relationship with God. He is given a crown. He is given the time. It is not of his own might or power but allowed by God. Mankind will be given over to what they want. (See the biblical definition of "antichrist" at 1 John 2:18-22, 4:3, 2 John 1:7). Also see the article,Two White Horses, Two Very Different Riders, Two Very Different Times. SEAL #2 / Revelation 6:3-4 "When He opened the second seal, I heard the second living creature saying, "Come and see." Another horse, fiery red, went out. And it was granted to the one who sat on it to take peace from the earth, and that people should kill one another; and there was given to him a great sword." We know from Revelation 13:1-18 and other Scripture, that he will head a one world empire. Like all leaders that lie, he will come on the scene to bring good, but he will be a master of deceit (Daniel 8:25). While he will speak peace, he will be conquering. And when ﻿peace is removed﻿, it will be uglier than ever (Daniel 9:27, Matthew 24:6-12, I Thessalonians 5:3). The seven seals truly correspond with Matthew 24, Mark 13 and Luke 21. Here is one section of verses in particular. Matthew 24:3-14 "Now as He sat on the Mount of Olives, the disciples came to Him privately, saying, "Tell us, when will these things be? And what will be the sign of Your coming, and of the end of the age?" And Jesus answered and said to them: "Take heed that no one deceives you. For many will come in My name, saying, 'I am the Christ,' and will deceive many. And you will hear of wars and rumors of wars. See that you are not troubled; for all these things must come to pass, but the end is not yet. For nation will rise against nation, and kingdom against kingdom. And there will be famines, pestilences, and earthquakes in various places. All these are the beginning of sorrows. Then they will deliver you up to tribulation and kill you, and you will be hated by all nations for My name's sake. And then many will be offended, will betray one another, and will hate one another. Then many false prophets will rise up and deceive many. And because lawlessness will abound, the love of many will grow cold. But he who endures to the end shall be saved. And this gospel of the kingdom will be preached in all the world as a witness to all the nations, and then the end will come." SEAL #3 / Revelation 6:5-6 "When He opened the third seal, I heard the third living creature say, "Come and see." So I looked, and behold, a black horse, and he who sat on it had a pair of scales in his hand. And I heard a voice in the midst of the four living creatures saying, "A quart of wheat for a denarius, and three quarts of barley for a denarius; and do not harm the oil and the wine." A short review first: The 1st seal, white, imitation Christ, authority given to conquer and goes out conquering The 2nd seal, fiery red, as in anger, peace is removed, stress in a large sense... The 3rd seal, darker and bleaker times, food scarce and expensive. Mark 13:8, "And there will be earthquakes in various places, and there will be famines and troubles." Direction was given to them not to harm the oil and the wine. This is also a possible sign to remind us that those who trust in the Lord will be helped as Elijah was helped by the ravens and the Zarephath widow with the unending flour and oil (1 Kings 17:8-16). SEAL #4 / Revelation 6:7-8 "When He opened the fourth seal, I heard the voice of the fourth living creature saying, "Come and see." So I looked, and behold, a pale horse. And the name of him who sat on it was Death, and Hades followed with him. And power was given to them over a fourth of the earth, to kill with sword, with hunger, with death, and by the beasts of the earth." By pale horse, it is meant pale like the pallor of sickly. The colors of the horses have gone from imitation white, to fiery red, bleak and dark and now pale like the pallor of a sick person. From alleged peace to people killing each other and wars, to inflation and now ¼ of the earth will be inflicted with death by sword, hunger, death and beasts of the earth. It is no wonder that people do not want to believe that Christians would have to go through this. However if God calls us to it, He will bring us through it. Once again, notice "the power" was given to them. This is allowed by God. The King James Version says, "famine and plague" as the New King James says "hunger and death." SEAL #5 / Revelation 6:9-11 "When He opened the fifth seal, I saw under the altar the souls of those who had been slain for the word of God and for the testimony which they held. And they cried with a loud voice, saying, "How long, O Lord, holy and true, until You judge and avenge our blood on those who dwell on the earth?" Then a white robe was given to each of them; and it was said to them that they should rest a little while longer, until both the number of their fellow servants and their brethren, who would be killed as they were, was completed." This is clearly Christians who died for their faith. Slain for the Word of God and the testimony which they held. White robes are given to them. This is only possible for Christians. And they asked how long it would go on? The answer is, a little while longer, until the number of brethren, fellow servants of the Lord are killed as they had been, until the number of them is complete. ﻿﻿SEAL #6﻿﻿ / Revelation 6:12-17 "I looked when He opened the sixth seal, and behold, there was a great earthquake; and the sun became black as sackcloth of hair, and the moon became like blood. And the stars of heaven fell to the earth, as a fig tree drops its late figs when it is shaken by a mighty wind. Then the sky receded as a scroll when it is rolled up, and every mountain and island was moved out of its place." "And the kings of the earth, the great men, the rich men, the commanders, the mighty men, every slave and every free man, hid themselves in the caves and in the rocks of the mountains, and said to the mountains and rocks, "Fall on us and hide us from the face of Him who sits on the throne and from the wrath of the Lamb! For the great day of His wrath has come, and who is able to stand?" This is the beginning of the rapture! Everything will be going dark (sun, moon and stars) preparing for the Lord to come in all His glory as He will illuminate the whole earth. The evil ones see Him realize the "error of their ways" and know that they are in huge trouble. Why would we look up and lift up our heads because our redemption is drawing near if we are not here to be caught up to the Lord? Mark 14:60-62 "And the high priest stood up in the midst and asked Jesus, saying, "Do You answer nothing? What is it these men testify against You?" But He kept silent and answered nothing. Again the high priest asked Him, saying to Him, "Are You the Christ, the Son of the Blessed?" Jesus said, "I am. And you will see the Son of Man sitting at the right hand of the Power, and coming with the clouds of heaven." Please see our article, Every Eye Will See Him. This is a global event. Heavenly event. Seen even in hell event. This is not a secret event or a quiet event. This is universal and cataclysmic event. This is a "woe unto the Lost" and "heaven to the Found." Six seals are past and the seventh is on the way. But first something important must be done! Chapter 6 is the first 6 seals opened and enacted. And going right away in chapter 7, the 144,000 Jews must be sealed to protect them during the time of wrath that will soon follow. Revelation 7:1-4 "After these things I saw four angels standing at the four corners of the earth, holding the four winds of the earth, that the wind should not blow on the earth, on the sea, or on any tree. Then I saw another angel ascending from the east, having the seal of the living God. And he cried with a loud voice to the four angels to whom it was granted to harm the earth and the sea, saying, "Do not harm the earth, the sea, or the trees till we have sealed the servants of our God on their foreheads." And I heard the number of those who were sealed. One hundred and forty-four thousand of all the tribes of the children of Israel were sealed:"
12,000 from each Tribe of Israel. Revelation 7:9-14 "After these things I looked, and behold, a great multitude which no one could number, of all nations, tribes, peoples, and tongues, standing before the throne and before the Lamb, clothed with white robes, with palm branches in their hands, and crying out with a loud voice, saying, "Salvation belongs to our God who sits on the throne, and to the Lamb!" All the angels stood around the throne and the elders and the four living creatures, and fell on their faces before the throne and worshiped God, saying: "Amen! Blessing and glory and wisdom, thanksgiving and honor and power and might, be to our God forever and ever. Amen." Then one of the elders answered, saying to me, "Who are these arrayed in white robes, and where did they come from?" And I said to him, "Sir, you know." So he said to me, "These are the ones who come out of the great tribulation, and washed their robes and made them white in the blood of the Lamb." SEAL #7 / Revelation 8:1 "When He opened the seventh seal, there was silence in heaven for about half an hour." The reason there is the silence in heaven is because this is when they come with Jesus to claim His own from this earth. This is the time of the rapture. 1 Thessalonians 4:13-14 "But I do not want you to be ignorant, brethren, concerning those who have fallen asleep, lest you sorrow as others who have no hope. For if we believe that Jesus died and rose again, even so God will bring with Him those who sleep in Jesus." 2 Thessalonians 1:6-10 "since it is a righteous thing with God to repay with tribulation those who trouble you, and to give you who are troubled rest with us when the Lord Jesus is revealed from heaven with His mighty angels, in flaming fire taking vengeance on those who do not know God, and on those who do not obey the gospel of our Lord Jesus Christ. These shall be punished with everlasting destruction from the presence of the Lord and from the glory of His power, when He comes, in that Day, to be glorified in His saints and to be admired among all those who believe, because our testimony among you was believed." To recap in closing: Seals 1- 4, the four horses of the apocalypse, happen over most of the first 3 1/2 years. But the 5th seal, comes into being, very close to the end and once it happens, the rapture must come quickly. The 6th seal is the earth and atmosphere giving way, as the sun and moon go dark, even the stars are effected. This is when the sky rolls up like a scroll. Many would say this is the second coming and not the rapture, but proof is in Matthew 24:1-51, Mark 13:1-37, Luke 17:20-37﻿ and Luke 21:5-36 as Jesus told what would happen leading up to seeing Him coming on the clouds for His people. Remember, the Battle of Armageddon is at the end of the 7 year tribulation period and the Lord is on a white horse with an army on white horses coming to do battle; He will not rapture anyone up at that time (raptured Christians will already have been in heaven for 3 1/2 years by then). The 7th seal is the rapture and all that goes with it. The 144,000 Jews must be sealed and much more. One final note: The seven seals are much different from the seven trumpets and seven bowls in two very interesting ways. 1. The seals do not involve being distributed by angels as the trumpets and bowls do. 2. The seals tell us of future events involving what the church and world will go through while the trumpets and bowls are the judgment and wrath of God upon the wicked.